Onam, the main festival of Kerala, is celebrated in lush green vegetation of the place and is a colourful festival. 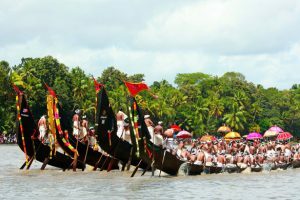 This picturesque harvest festival comprises of boat races and elaborate feasts. This is a vibrant occasion and involves traditional songs and dance. It is celebrated for 10 days. Onam celebrates the golden age of King Mahabali, the mythical ruler of Kerala. The festival welcomesthe spirit of King Mahabali, assures that his people are happy. It is believed that the Devas or Gods were apprehensive about the wise rule of Mahabali, the Asura king. They feared his wisdom and were concerned about his rising power. They sought the help of Vishnu (the preserver in the Hindu trinity) to curb Mahabali’s power. Vishnu, in the form of a dwarf called Vamana, approached him. The king offered a boon to him. The Vamana asked for three pieces of land and the king agreed to it. In a little while, the dwarf began to get bigger and with the first step, he covered the sky, and with the second, he covered the hindmost world. Realizing that the Vamana’s third step would destroy the earth, Mahabali offered his head as the last step. The Gods were relieved, and since Mahabali was extremely attached to his kingdom and because people loved him very much, he was allowed to return once a year. Onam (Thiruonam) is considered to be the day when King Mahabali comes to visit his beloved people. The festivity begins, ten days before Thiruonam, with adorning floral decorations (Pookkalam) in every home. At Trichur (Thrissur), caparisoned elephants take part in a spectacular procession. A glorious exhibit of fireworks indicates end of the festival. At Cheruthuruthy, an enthusiastic crowd gathers on the green, where the Kathakali dancers, resplendent in their brilliant costumes, enact stories of epic heroes and virtuous women. Pulikali, also known as Kaduvakali is a common sight during the Onam season. Performers painted like tigers in bright yellow, red and black, dance to the beats of instruments like udukku and thakil. The Vallamkali (boat race) is one of the main attractions of Onam, and is best seen at Aranmulai and Kottayam. Nearly a hundred oarsmen row huge odee (boats). Oars dip and flash to the rhythm of drums and cymbals in each boat. The songs are typical and are characteristic of the people in Malabar. Each boat has a gleam scarlet silk umbrella on the top: their number denotes the affluence of the family that owns the boat. Gold coins and frills hang from the umbrellas. In the evening girls perform the Kaikottikkali (Thiruvathirakkali ) in the open, dancing around the traditional brass lamp.